In the neighborhood of the palaces in the Byzantine fortress town of Mystras. 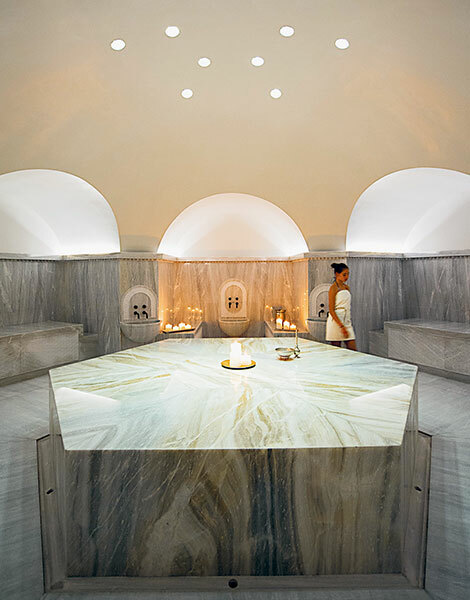 The area around the Byzantine town has growing options for visitors, with several new top quality spa resorts offering visitors holistic travel experiences. The magic of Mystras first begins to work on you as you walk in the archaeological site – especially in the spring when the wildflowers and the birdsong add to the atmosphere. The Byzantine fortified town consists of palaces, mansions, fortifications, churches, monasteries and simple homes. Its founding is connected to the first sacking of Constantinople by the Crusaders and the fragmentation of the Byzantine Empire in the early 13th century. It began to wane at the end of the 18th century, and the last residents abandoned Mystras for the new town of Sparti in 1853. In the square of the eponymous village nearby, a few cafes and tavernas have long catered to passing visitors who would stop in the area for a few hours to see the ruins. 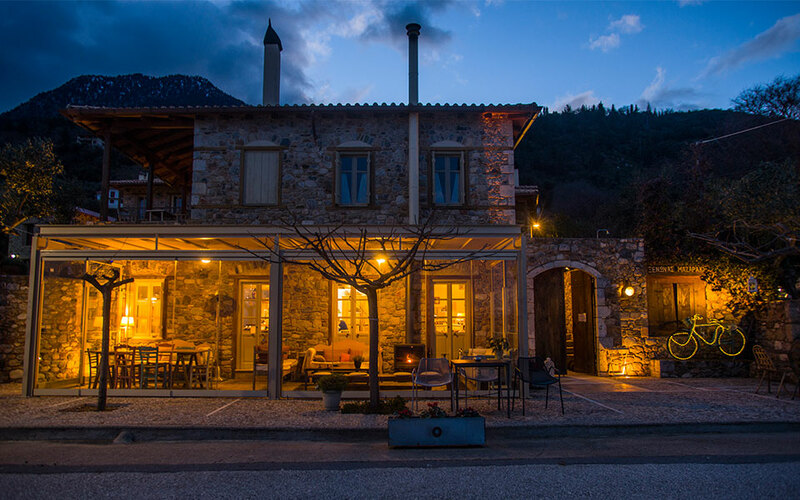 But over the past year, Mystras has changed, developing into a standalone destination in its own right, thanks to new hotel complexes with an emphasis on wellness services. The new profile is one that combines tours of the Byzantine streets with high quality accommodation and luxury spa facilities. To drive from Athens estimate about 3 hours without stopping and 45 euros each way with tolls. For information about intercity KTEL buses, contact the Laconia (tel. 27310-26441) or Athens (tel. 210-5124913) ticket offices. The few tourism enterprises in the eponymous village of Mystras are clustered around the main road. 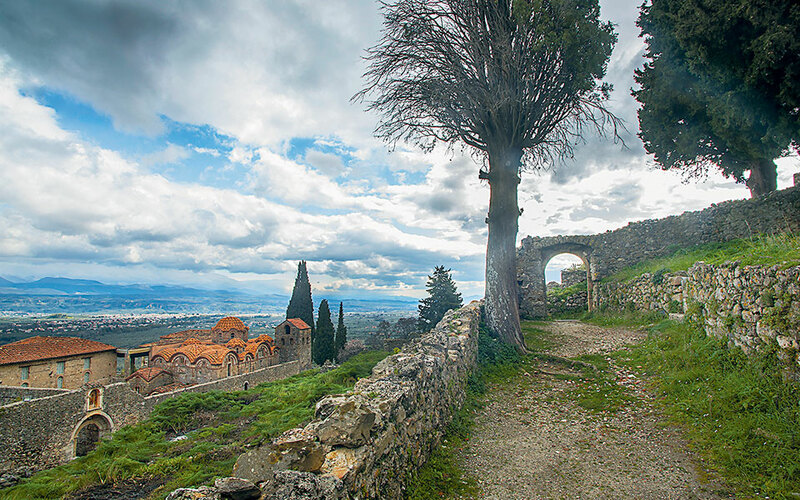 Mystras is a wonderful place for a stroll, particularly in the spring. The archaeological site is located in the foothills of Mt Taygetos, spread over a hill whose steep slopes render it a natural fortress. Of its two entrances, the one in the south seems to be more popular. But for those seeking to retrace the fortified town’s history chronologically, it is better to start at the second northern entrance; the route from here is also easier as it is downhill. 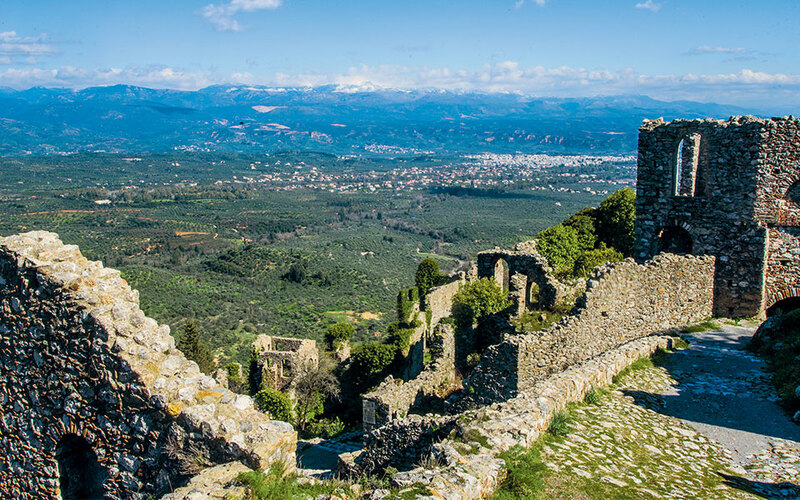 At the highest point, the Castle of Myzithras was built in 1249 (the year Mystras was founded) by the Frankish prince William of Villehardouin who used the stronghold to control the entire Evrotas Valley. The views of the fertile valley from every point of the castle town are stunning. The next important stop is Aghia Sophia, in the area of the palaces, which was founded in the mid 14th century by Manuel Kantakouzenos, the first Despot of Morea. A bit further down, the palaces resemble a never-ending building project due to the restoration work that never seems to be completed which would allow them to open to the public. These were once inhabited by members of the Katakouzenos and Palaiologos dynasties. Note that in Mystras in 1448 the last Byzantine emperor was crowned – Constantine XI Palaiologos. Visitors on an old footpath of the Byzantine castle town of Mystras. 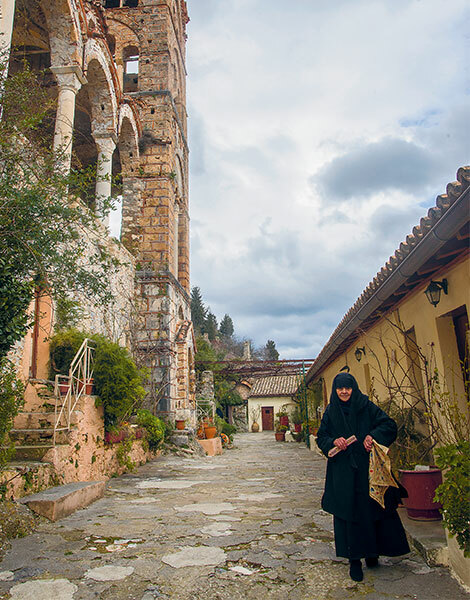 Sister Akakia, one of the six nuns who live in the Pantanassa Monastery of Mystras. The path continues, passing through the Monemvasia Gate. On reaching the Monastery of Pantanassas, you realize that Mystras is not totally abandoned. The monastery was re-inhabited in 1885, and today is occupied by 6 nuns. “I am very happy,” 72-year-old Sister Akakia tells me with a small smile. Our conversation is accompanied by the classic treats offered to visitors: mountain tea, a spoon sweet and cherry liquer. Considerable younger is Sister Agni, who shares with us her personal motto: “Mystras, kosmikos – apokosmos.” “Mystras, worldly and divine.” Clearly life here encompasses both: the worldliness of coming into daily contact with tourists during the site’s opening ours, and the charm of the place being inhabited by just six women when the gates shut. Continuing downhill, the alleys lead to the Cathedral of Agios Dimitrios which was founded around 1270. It went through various phases of construction and took its current form in the second half of the 15th century. The west wing of the cathedral also houses the Archaeological Museum of Mystras. A number of churches have been preserved in good condition amidst the ruins of homes and other buildings. Here, aside from the tourists, the area is also prowled by some of the most well-fed cats I have ever seen in the countryside. They are cared for by the guards, and their coats look like those of house cats. 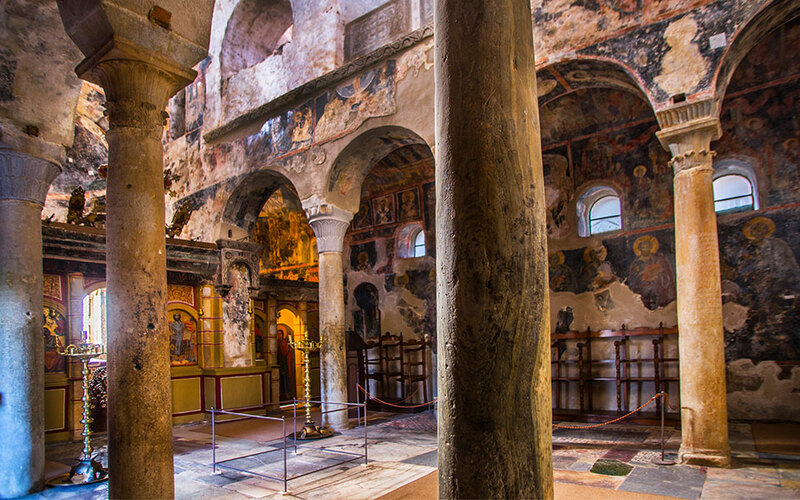 One of these accompanies us to the Peribletos Monastery – an impressive edifice in the southwestern corner of Mystras. Its stone entranceway, courtyard with the monastery’s defensive tower and the church dedicated to the Virgin Mary (mid 14th century) are full of decorative details. The frescoes of the church were created by 4 different iconographers and are considered among the most important collections of artworks of post-Byzantine art. Before you visit, call ahead to see if the Peribletos Monastery will be open on the day you are interested in. There are a large number of important ruins in Mystras, and there are not always enough guards to cover the entire site. 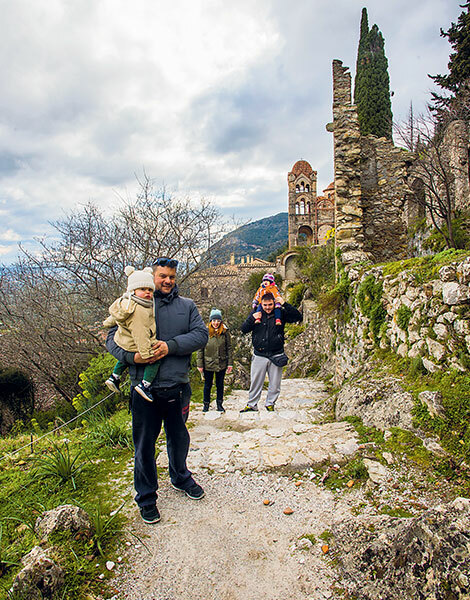 Mystras is embracing a new era, offering a sophisticated and holistic tourism experience, with high quality resorts seeking to woo travelers with myriad services beyond basic hotel amenities. 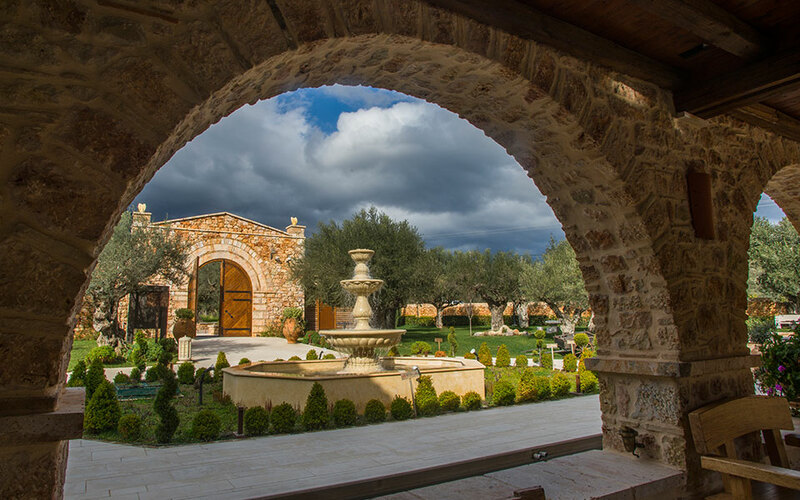 One such resort, the recently opened Mystras Grand Palace Resort & Spa, seeks to blend harmoniously with the Laconian landscape through its stone-built lodgings interspersed with olive trees. The resort features a conference hall, tennis courts, outdoor swimming pool, spa facilities and wellness professionals offering comprehensive treatments. The facilities are complemented by the Symposium wine bar and the restaurants Palataki and Elia, featuring unique dishes by chef Giorgos Apostolakos, such as the exquisite grouper fricassee. The hotel’s restaurants and wine bar are rapidly becoming favored meeting spots for the residents of Sparti, which is only 10 minutes away by car. Likewise, the wellness facilities are open to all, not just hotel guests. The owner of the resort, Dimitris Kaloeidis who hails from the region, first and foremost wanted to create an enterprise that would become part of the local community. He has succeeded on many levels; currently the resort employs 70 people, the majority of whom are from Laconia, says manager Panikos Papanikolaou. And another resort is nearing completion, in the neighboring village of Parori. Known as Kyniska Palace and owned by the same group as the two Kyniska hotels in Monemvasia, it is expected to open in June of this year. “That was by chance,” laughs Alexis Alexopoulos, the food and beverage director of the chain about the happy coincidence of Kyniska launching operations at almost the same time as the Mystras Grand Palace. These two new resorts, together with the Euphoria Retreat (also recently launched and which comprises a category of its own) add another dimension to Mystras, rendering it a self-contained destination in its own right in the already rich tourism map of Laconia, near Monemvasia and Mani. Euphoria Retreat, a holistic destination spa that blends ancient Greek and Chinese approaches to wellness, is another small palace. 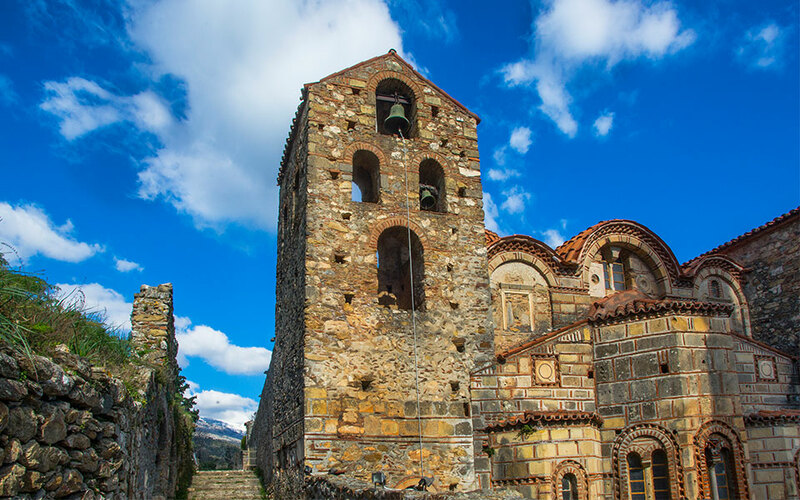 With its architecture, it has improved the aesthetic of the entire village of Mystras from afar. 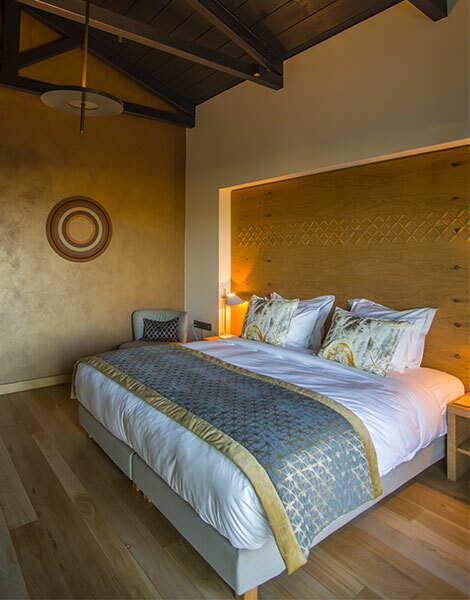 Up close, it features natural materials, with metal, marble and onyx in the bathrooms of the rooms, and a planted roof, while the entire complex is surrounded by the forest. A deep Byzantine purple meets Asian influences and Chinese-style buttons in the uber-elegant staff uniforms. For those not well acquainted with the concept of destination spas, it is worth nothing that they are not primarily directed at those simply looking for a few days’ vacation, but to those seeking a “time out” to care for body and soul. The layout of the restaurant Gaia is conducive to socializing and sharing, with long common tables. In accordance with that philosophy, using the Wi Fi is only allowed in the rooms and lobby. Here too, priority is given to hiring young people who live in the area. One such person is Maria Kalogeraki, a 25 year old from Sparti, who studied business administration before retraining in the hospitality industry, and who found herself in the right place at the right time. Each of the above enterprises arranges hikes on Mount Taygetos and other nature-loving activities. If you instead choose to stay in one of the area’s guesthouses, keep in mind the Sparti branch of the Hellenic Mountaineering Club of Sparti (tel. +30 6945-832701), and the fact that Taygetos has many gorgeous paths that are well signposted. And note that even if you stay elsewhere, each of the above resorts offer day wellness packages for non guests. 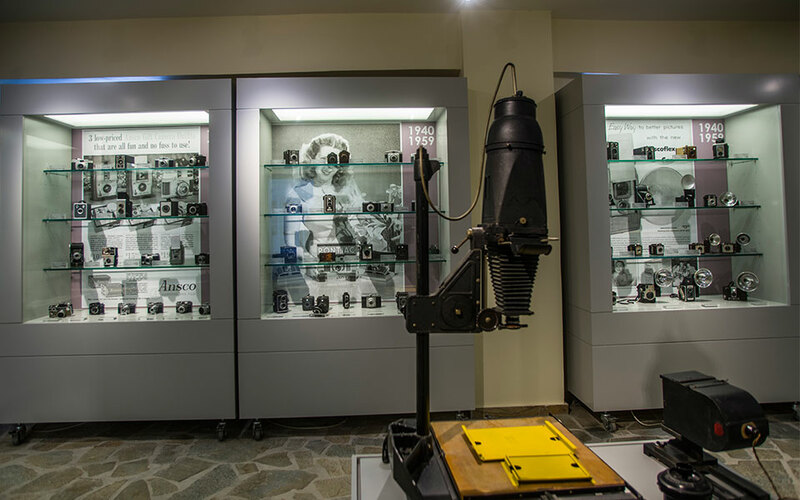 At the Camera Museum Takis Aivalis (+30 27310-81085) you will see a large collection of old and rare camera models. 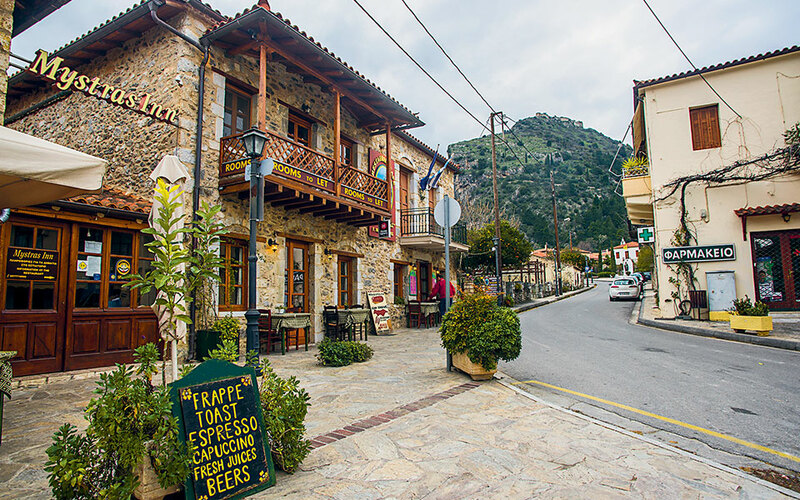 Around Mystras you can also explore a number of small villages, each with a taverna or two, such as Taygeti and Anavryti. Somewhat more touristy and lively is Pikoulianika. “The new hotels have done a lot of good for us,” says Natassa Iliadi, who works at Guesthouse Mazaraki. “We don’t see them as competitors, one complements the other. The new road and the airport at Kalamata have, of course, also helped a lot. As she speaks, the orange cake which is baking in the oven is filling the space with a wonderful scent, and the wood-burning stove is radiating warmth. Of the tavernas in the area, standouts include Chromata (tel. +30 27310-23995) and Pikoulianika, for the local products that are the focus of their flavorful dishes, as well as for the inherent warmth of their staff. Euphoria Retreat (+ 30 27313-06111). From €416 per night with breakfast and a free 50 min treatment and access to the spa facilities. Mystras Grand Palace Resort & Spa (tel. +30 27310-21111, mystraspalace.com). From €90 for a double. Guesthouse Mazaraki (tel. +30 27310-20414). Rooms and suites of different types, some with fireplaces. A rich Greek traditional breakfast is served in hampers in the rooms. From €90. Pyrgos Mystra Guesthouse (tel. +30 27310-20770, 20870). A Guesthouse in the heart of the village of Mystras. From €190 for a double.